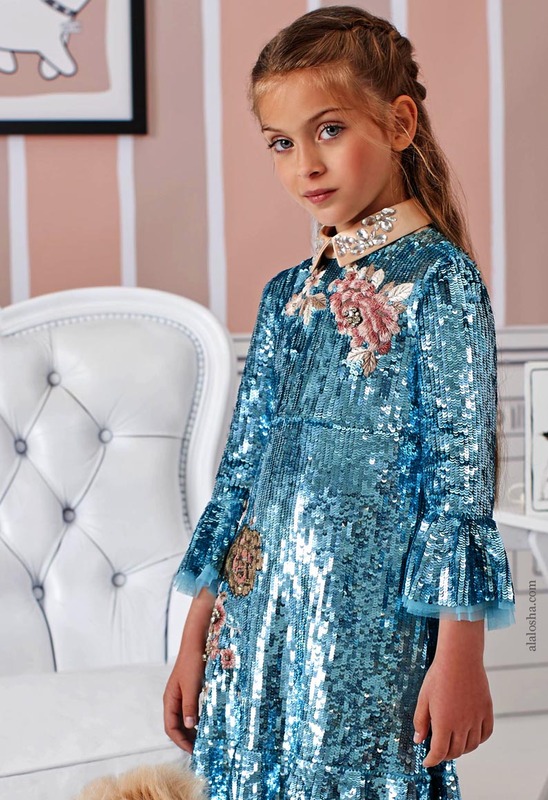 “Little girls love to feel like modern princesses and the collection lets them live out a fairy tale with a glamorous touch”, says the designer Frachi. La mia Bambina collection for the little girls who want to dream, lines with a graphic effect and items embellished with laminated gold profiles. Finally, for a fun favourite there’s Betty Doll, the designer’s icon added as a print or embroidery to give a personal touch to the looks. Stars are a leitmotif of the Elisabetta Franchi – La mia Bambina collection! 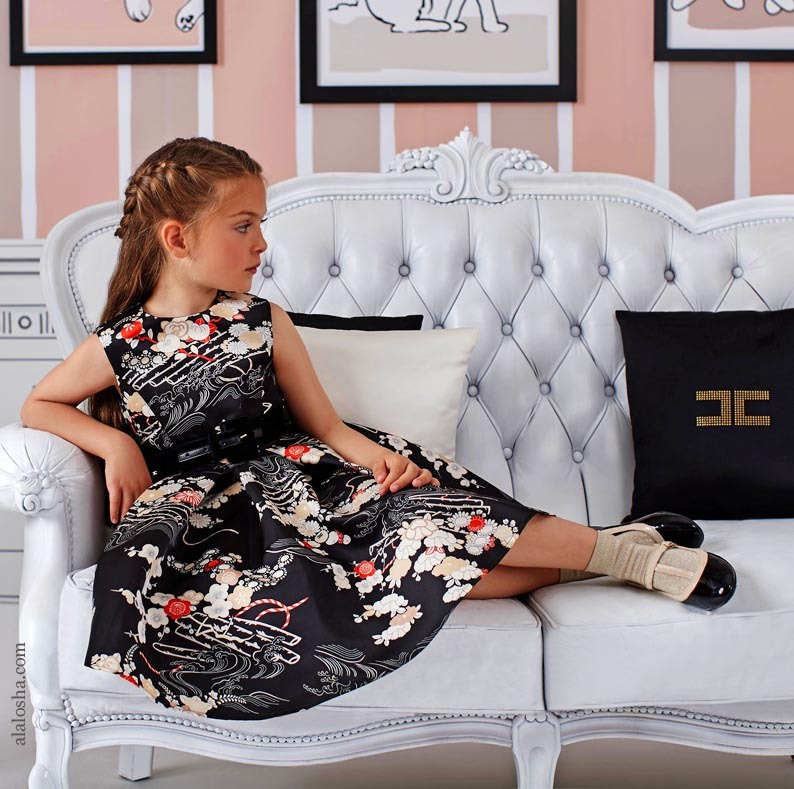 The new development of the season for the stylist Elisabetta Franchi is the launch of her first “La mia bambina” collection for little girls. “I wanted to reproduce the key features of the women’s collection in a Mini-Me version to let girls dress like their mums”, says the designer. “I believe in a true blend of colour, imagination and beauty. Even shopping can become a time for playing and bonding”. For everyday fashion a special focus was placed on versatile and carefree items like the new jumpsuits that can be divided into two pieces so that they can be worn for a variety of occasions. And for the evening, stars all over: the star is the dominant motif that shines through the prints, combined with sequins, charms or precious embroideries. The Fifties are the theme of this kidswear line. The must-haves of the woman’s main collection are miniaturize for the little girls. Balloon skirt, empire cuts, t-shirt, divisible jumpsuite e mini bag are the stars of the FW 17. Betty Doll, Elisabetta Franchi’s mascot, is printed on clothes to make them unique. “This fall will offer a flashback to the 1950s, perfect for little girls”, continues the designer. In the spotlight: balloon skirts, empire cuts, high-waisted cropped trousers, along with a range of embroidered T-shirts that recall the must-haves of the women’s line. “I also added some small details: the girls can have fun with patterned satin collars to match with sweatshirts or blouses as they want. And three handbags that turn into treasure chests to hold little secrets".